This example demonstrates coordinate transformations and the creation of visibility curves to assist with observing run planning. In this example, we make a SkyCoord instance for M33. The altitude-azimuth coordinates are then found using astropy.coordinates.EarthLocation and astropy.time.Time objects. This example is meant to demonstrate the capabilities of the astropy.coordinates package. For more convenient and/or complex observation planning, consider the astroplan package. Let’s suppose you are planning to visit picturesque Bear Mountain State Park in New York, USA. You’re bringing your telescope with you (of course), and someone told you M33 is a great target to observe there. You happen to know you’re free at 11:00 pm local time, and you want to know if it will be up. Astropy can answer that. astropy.coordinates.SkyCoord.from_name uses Simbad to resolve object names and retrieve coordinates. astropy.coordinates.EarthLocation.get_site_names and get_site_names can be used to get locations of major observatories. Use astropy.coordinates to find the Alt, Az coordinates of M33 at as observed from Bear Mountain at 11pm on 2012 July 12. 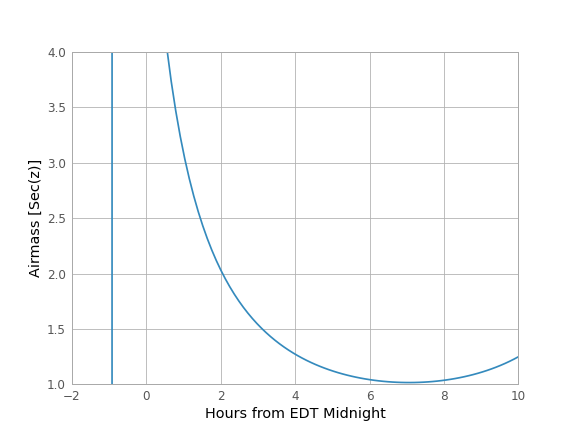 This is helpful since it turns out M33 is barely above the horizon at this time. 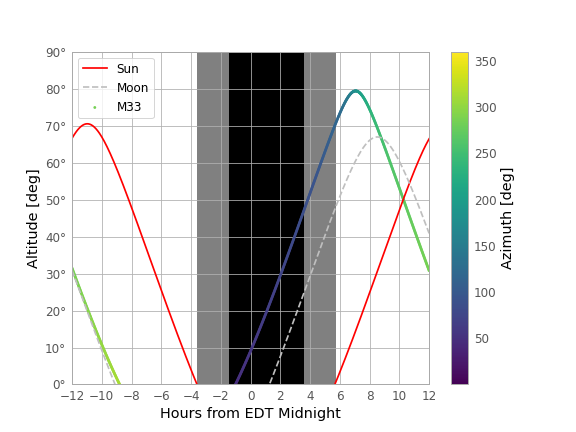 It’s more informative to find M33’s airmass over the course of the night. Do the same with get_moon to find when the moon is up. Be aware that this will need to download a 10MB file from the internet to get a precise location of the moon.